안녕하세요, 29기 단장 최대민입니다. 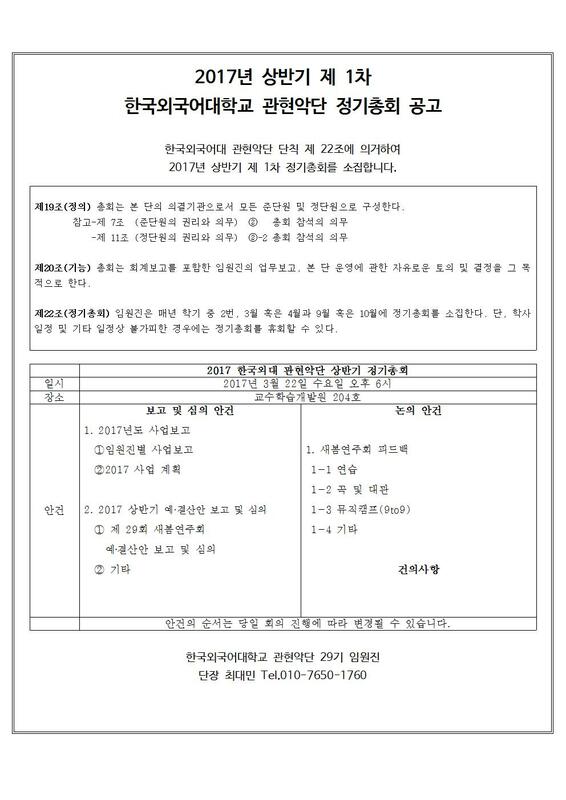 훕스필 단칙 제 22조에 의거하여 , 2017년도 훕스필의 새봄연주회와 기타 사항들을 상반기 주요활동을 소개하는 훕스필 하반기 정기총회가 있을 예정입니다. 상반기 정기총회에서는 새봄연주회 사업보고, 훕스필 예, 결산안 심의 및 보고, 새봄 연주회 평가 등이 있을 예정입니다. 재학생 단원 여러분의 많은 관심과 참여 부탁드립니다. crowns known as fashion jewelry stefana. These crowns symbolize heavenly crowns and also that the husband and wife are king and queen of the family. The crowns are usually joined by a ribbon to symbolize their unity and are Wedding Rings placed on the head of the bride and groom by the priest in a Crowning Ceremony. Years ago, the crowns would be worn for a whole week, but shoulder handbags this is not usually practiced.